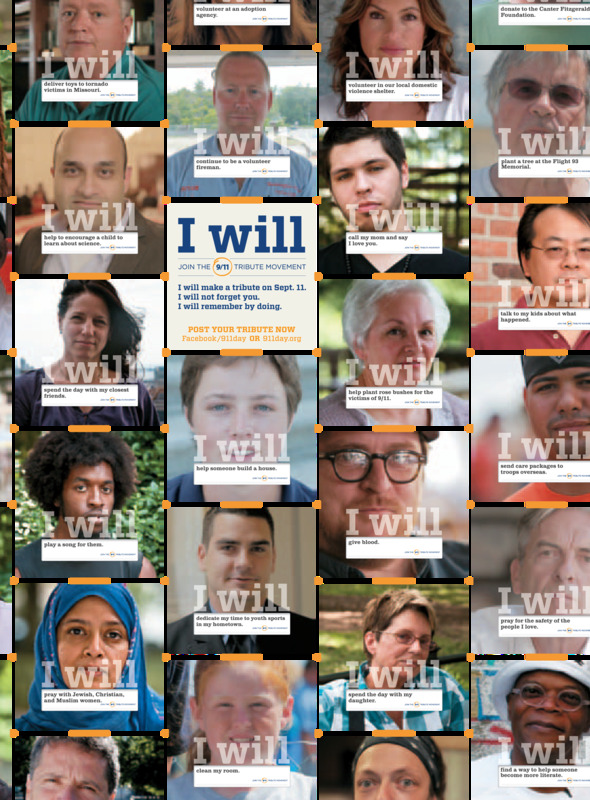 In observance of the 10-year anniversary of 9/11, Deutsch LA joined forces with MyGoodDeed, a leading 9/11 nonprofit organization, and HandsOn Network, the volunteer activation division of Points of Light Institute, on the comprehensive “I will (pay tribute)” public service announcement campaign. 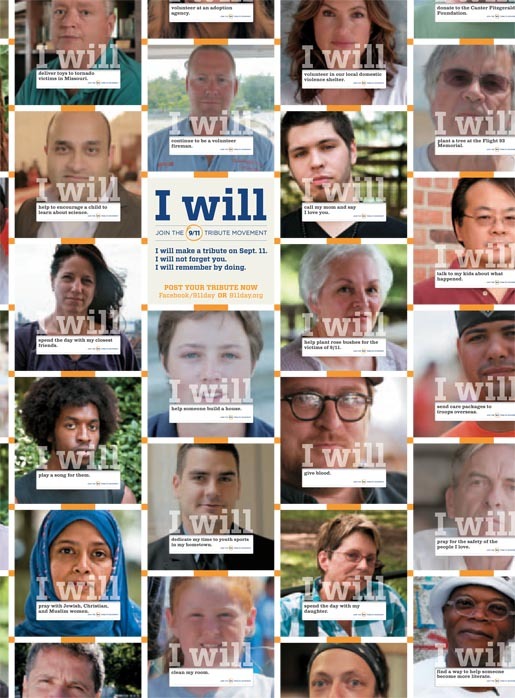 “I will” is an outgrowth of MyGoodDeed’s mission to inspire millions of people annually to dedicate the day of September 11th to voluntary works of charity, good deeds and compassion. 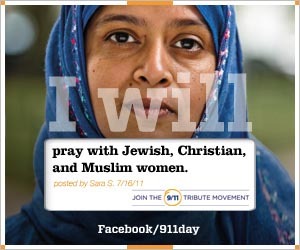 The “I will (pay tribute)” campaign’s goal is to get 1 million people to remember by doing on 9/11. TV, online, out of home, radio, Facebook and print material centre around a digital quilt made of tributes—a post, a video or photo upload— posted by 9/11 families, first responders, celebrities and everyday Americans, housed on 911day.org and the 9/11 Day of Service Youtube Channel. 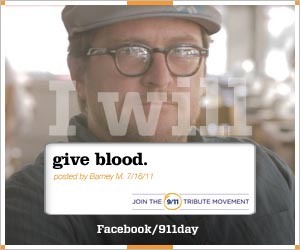 The campaign includes two new Facebook applications: the 9/11 Tribute application, which enables individuals to post their plans for 9/11 on Facebook.com/911day; and the “I will volunteer” application. The I Will campaign was developed at Deutsch Los Angeles by chief creative officer Mark Hunter, group creative director Michael Kadin, integrated creative director David Sing, senior copywriter Max Godsil, senior art director Jamie Levey, director of integrated production Vic Palumbo, director of broadcast production Victoria Guenier, music supervisor Marisa, associate producer Emma Johnson, CEO Mike Sheldon, director of account management Kim Getty, group account director David Dreyer, account director Adam Thomason, account supervisor Christi Johnson, account executive Jamie Friedman, director of integrated business affairs Abilino Guillermo, associate director of business afairs Gabriela Farias, associate business affairs manager Boryana Marquez,, director of broadcast traffic Carie Bonillo, broadcast traffic Monica Garcia, media planner Kristen Ybaben. MyGoodDeed.org staff were president David Paine, social media director Eric Paine. GOOD/Corps creative credits and titles by executive creative director Kirk Souder. Filming was produced at Moxie Pictures, Los Angeles, New York, London and Asia, by executive producer Lizzie Schwartz, head of production Roger Zorovich. The Washington DC shoot was by director Andrea Buchanan, producer Salli Zilles, director of photography Ed Stephenson and Luca Fantini, production supervisor Veronica Diaferiam, stills photographer Eli Turner. The New York shoot was by director Pam THomas, producer Salli Zilles and Elena Halvorson, cameraman Ed, production supervisor Veronica Diaferia, director Henry Lu, producer Salli Zilles, cameraman Luca Fantini, cameraman Jamie Stuart, production supervisor Veronica Diaferia, stills photographer Kevin Ritchie. The Wisconsin shoot was by director/cameraman Bob Purman, production supervisor Yannique Purman, AC Michael Kubaszak. The Pennsylvania shoot was by director Henry Lu, producer Salli Zilles, cameraman Luca Fantini, production supervisor Veronica Diaferia, stills photographer Cristina Faramo. The Los Angeles shoot was by director Dana Shapiro, producer Salli Zilles, cameraman Steve Harnell, production supervisor Air Schneiderman, stills photographer Huey Tran. Editorial work was done at Rock Paper Scissors, Los Angeles, by editor Grant Surmi, assistant editor Austyn Daines, executive producers Linda Carlson and Eve Kornblum, producers Justin Kumpata and Esther Gonzalez. Post production and visual effects were produced at A52, Los Angeles, by colorist/online editor Paul Yacono, 2D artist Scot Johnson, executive producer Jennifer Sofio Hall, head of production Megan Meloth, associate producer Jamie McBriety. Music included “Big Ship”, by Brian Eno, and “Straumnes” by Sigur Ros. Audio post production was done at Lime Studios by mixer Joel Waters, assistant Brian Peyton, producer Jessica Locke, and at Eleven Sound by mixer Scott Burns, producer DJ Fox-Engstrom, scheduler Caroline Suliivan. The highly inspiring, thought-provoking campaign was conceived by a world-class creative team lead by GOOD/Corps, Partner with M., Deutsch LA and Rock Paper Scissors, with production by Moxie Firecracker Films. Talent was lead by Los Angeles-based Creative Artists Agency Foundation, New York-based Sunshine Sachs and New York-based The Narrative Group. Web development was led by Partner with M., with Facebook applications developed by MagicBullet. Each of the firms either donated all of their professional time to the effort or provided substantial discounts, totaling more than $1 million in creative services.